It has 4 different effects: scroll, fade, type and slide. 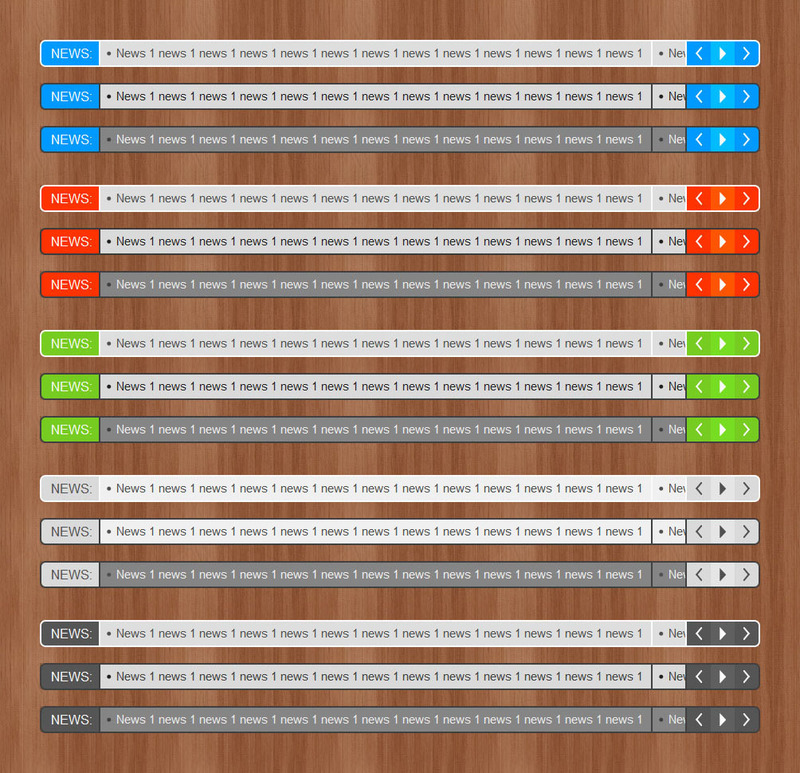 It has 4 different layouts that include news items, front label and control buttons. The corners can be set to either round or square. News items can be entered manually or WP posts can be used as news items. Additionally, WP posts can be used as a feed source. It can load RSS, JSON and Twitter feeds. The feeds can be set to automatically refresh. It has 30 settings available that control the content, effects, feeds and other behaviors. It has 3 methods that control the autoplay and the feed refresh. It includes continued support and upgrades. This is the WordPress version of the jQuery plugin that has over 1700 sales. If you are looking for the jQuery plugin, you can find it here. Future updates and developments will be listed here and the files will be free for anyone who has purchased the ticker at any time. As Yahoo recently shutdown the YQL service, the “YQL” load process type for RSS feeds was removed. The “rss2json” load process is now the default one for RSS feeds and the “Self” load process is also available as a backup. As backward compatibility, if the ticker has the load process set to “YQL”, it automatically defaults to “rss2json”. Fixed a bug that was causing the “Post tags” setting from the “Feed” metabox to be shown when not applicable. Added an option to select post tags to the “Posts” feed. 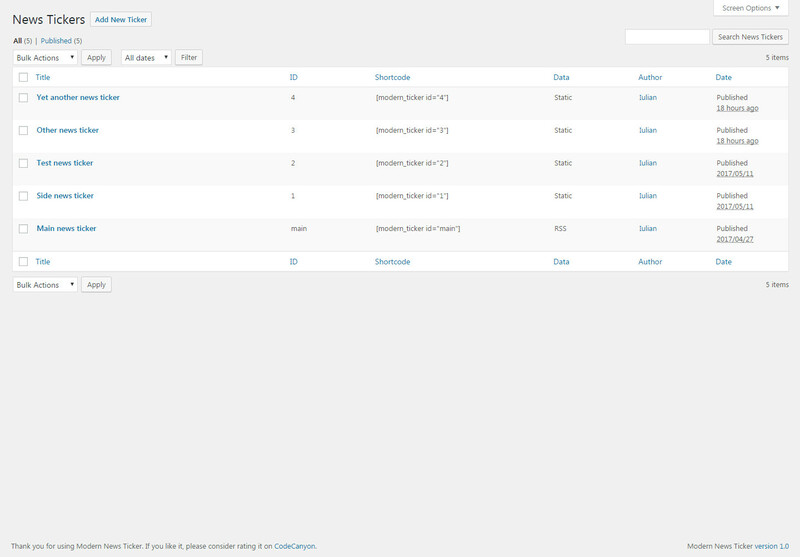 Added a “Tags” column to the “Add Posts” modal. Fixed an error that was sometimes occurring on the admin page when saving a ticker, in some older versions of PHP. Added an option to select post categories to the “Posts” feed. Added a “Categories” column to the “Add Posts” modal. Added the possibility to add WP posts as news items. 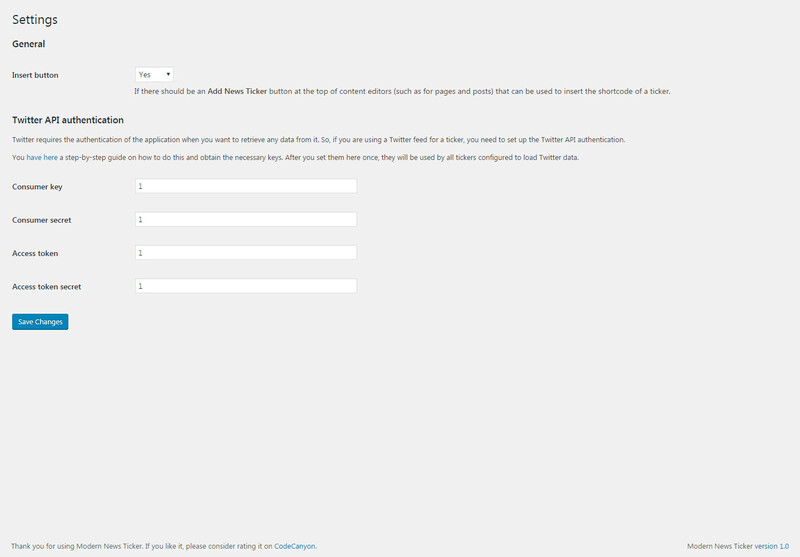 Added a new feed option to be able to use WP posts as a feed source. Fixed an issue that was causing the RSS feed not to load properly when using the “rss2json” service from a page on HTTPS. Made an improvement to the admin JS files so that errors from unrelated JS files no longer sometimes stop them from being run properly. Fixed an issue that was causing not all created tickers to show sometimes in the shortcode insert modal. Fixed an issue that was causing not all created tickers to show sometimes in the widget dropdown. Other small modifications and improvements. Improved the code comments for the main plugin file. Fixed an issue that was causing the post type single page not to work properly without updating the permalinks. Improved the way the JSON feed is loaded when “Load type” set to “Process”. Made improvements to the insert modal look and code. Fixed an issue that was causing the shortcode content not to be displayed in the proper place sometimes. Fixed an issue that was causing the ticker post page not to display properly in some older versions of PHP installs. Improved the code so that the same ticker (with the same ID) can now be added multiple times on the same page. Improved the code so that the ticker CSS file is only loaded when the shortcode is used on the page. Improved the update functionality so that it is no longer required to deactivate the plugin when updating the files. Added support to be able to install the Envato Market plugin from an admin notification. This can be used to easily install and update any of your Envato WP projects, including the ticker. Made a series of other small modifications and improvements.